Sebastien Leger was not able to make it due to a visa delay. As a result we are bringing you Modular Nights with local Modular talent and resident DJs Crosstalk, JOill, Keith Kraft, Sax Taxi and MFYRS. Come support your favorite Modular DJs and personal friends at what will be another fantastic night at the beautiful Audio Discotech with its class Funktion One sound system. 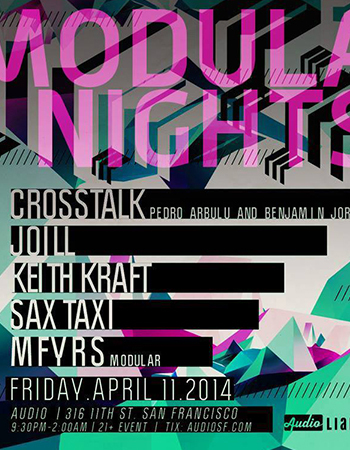 Crosstalk is a duo of two San Francisco based producers: Benjamin Jorgens and Pedro Arbulu. From deep and heavy to upbeat and funky, this covers the wide range of sounds you are likely to hear from them both above and below ground. JOill, Detroit-bred, has been calling San Francisco his home since 2001. His name is a combination of the classic American name, “JO”, combined with his Korean roots & middle name,”ill”, which, let’s face it, sounds awesome in any language. JOill has been performing since 1986. His background & training as a jazz saxophonist granted him the soulful musical comprehension that he would later incorporate into his dance music career. The concrete jungle classrooms of Chicago and Detroit were geographically accessible in his development and gave him the urban exposure that can’t be taught on paper, giving him the edge he needed to break into electronic music. For nearly 20 years, JOill has been creating “the good vibe,” on the dance floor as a DJ with multifaceted selections that vary with his surroundings. While today his sound is certainly deep-and-tech house focused, Soul, Indie Clash and Nu-Disco elements are sure to surface when the moment permits. Overall, JOill makes it clear that creating an infectious groove prevails above any attempt to stay within genre lines. It’s his commitment to this fundamental ideal that’s landed him residencies with some of San Francisco’s most reputable nightlife staples, including the acclaimed BASE nights at Vessel, members-only club The Battery, and DJ collective powerhouse, Modular. Using SF as his jumping-off point has led to gigs at some of the world’s most reputable festivals & clubs (including BPM, Coachella, Lightning in a Bottle, Burning Man, Vessel, Audio, Monarch, Public Works, Harlot & SupperClub) playing alongside electronic music royalty like Damian Lazarus, M.A.N.D.Y, BLOND:ISH, Stil Vor Talent, Adriatique and Infinity Ink…to name only a few. Next up for this emerging artist is a European tour this summer. Keep an eye out for JOill in the spotlights of cities like London, Amsterdam, Florence, Rome, Berlin, Sofia, Paris, Barcelona and Madrid, where he’ll surely impart his magic of reminding crowds what it feels like to truly connect with a DJ. Jon Sax approaches the electronic music scene first and foremost as an enthusiast. As a Detroit native, his love affair with house and techno began through attending underground events of local DJs and producers from Ghostly International, Paxahau, Detroit Techno Militia, and Gary Springs Hunting Club. From there he began DJing and promoting in Ann Arbor through his student group MEDMA. After three years at Bullitt in Washington DC, he’s been at Liaison Artists in San Francisco since 2013. Whether he’s in the middle of a mix or just out supporting his artists, you’ll see his smile behind the decks of the best clubs and festivals around the world. Having performed alongside the world’s top electronic artists, such as Moby, Hernan Cattaneo, Tube & Berger and Oliver Koletzki, Pedro has a passion for deep, dark and driving hypnotic music from deep tech house to disco. Off the dancefloor, Pedro shares his inspiration in musically possibilities by teaching music production to aspiring electronic musicians at the prestigious Pyramind Training Music & Audio Production School in San Francisco.